One tweet. Four deliberate, purposeful lies. This tweet got a little loss in the political firestorm of the last couple days, which is understandable. Not only did Trump disparage Haiti and refer to African countries as "shitholes," but he managed this act of indecency on the eight year anniversary of the Haitian earthquake and on the cusp of Martin Luther King, Jr. weekend. Timing is everything, I guess. The real reason that Trump has cancelled his London trip is out of fear of massive protests (a fact the White House reported before Trump attempted to change the narrative) , but in addition to this lie, the tweet contains three other lies. President Bush sold the former embassy and initiated the move. NOT Barack Obama. 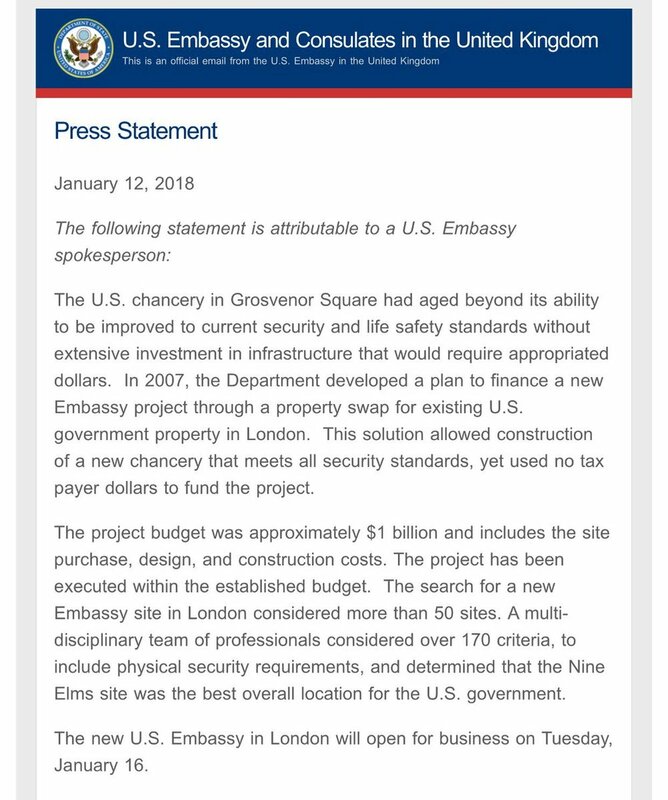 The sale of the former embassy paid for the new embassy, so the price of the new embassy is irrelevant. It didn't cost American taxpayers a dime. The move was made for security reasons. The former embassy was not deemed safe and secure enough for our diplomats, so a change was necessary. His tweet was so inaccurate and disparaging that the US embassy in the United Kingdom put out a press release correcting his lies. With any other President, a statement containing three deliberate lies in order to support a fourth lie would be an scandal of enormous proportions, but Trump lies so often and with such impunity from his party or supporters that this tweet is all but forgotten amidst the hundreds of other lies and racist remarks. These are not normal times, even though a small but still astounding 36% of Americans continue to support this racist, coward, and serial liar.